There’s been a lot of snow today in our corner of south-west London: around 6 or 7 inches (I still can’t quite come to grips with snow in centigrade) from the stuff that fell overnight last night, plus the stuff that has been falling all day; and more is forecast for this evening and tonight. There are a few pictures to flick through here. (Click the first one and then move through the rest using the arrows at the top.) I’ll put a specimen below as well. Some snow pundit on the radio says that the UK record for snowfall remains 89 inches in County Durham in 1949. Be that as it may — and I for one don’t believe it — today’s modest blanket is both pretty unusual and faintly alarming. There are no buses running in London today, and very few trains or tubes (subway trains). As it happens, J. had a medical appointment up in north London in the early afternoon. Even if we had managed to struggle through the snow to the nearby railway station and had been lucky enough to get one of the very few trains stopping at it, followed by similar luck with a tube from Waterloo, there could well have been real problems over the return journey home, and being stranded in north London wouldn’t have been a lot of fun. (It’s been well below freezing all day.) Fortunately, or otherwise, the medic who had been due to see J. answered his mobile to say that he wouldn’t be able to get in today, so we’ll try again tomorrow, although there’s no evidence that it will be any better then. We have lived, worked and driven assorted modest cars through far more sadistic winters overseas: two in Moscow, three in Warsaw, four in New York, one on the great lakes in Canada; so we still have the clothing, the shovels, the stiff long brushes, the de-icer fluids, and some familiarity with the varying uses in ice and snow of the reverse and second gear facilities of the modern car. We also know about the importance of grit. 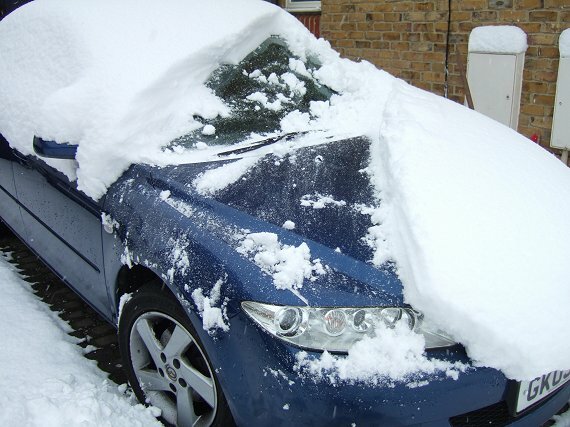 In Moscow just clearing the snow from the car and scraping the solid ice from the windscreen each morning, then digging out the snowdrifts immediately in front of the wheels, was a formidable task, and I was younger, fitter and leaner then. I used to go out into the great courtyard and car park of the foreigners’ ghetto at 1 or 2 in the morning, wearing six layers of heavy clothing and a fur hat, to start the engine of our humble Ford Cortina and run it for half an hour so as to improve our chances of getting it started in the morning and so get in to work. Often others who had not taken the same precaution would appeal for a tow-start when they heard the Cortina engine cough into life. I once towed a Saudi First Secretary for about four miles along the snow-drifting avenues of Moscow before he managed to get his huge American car started — and when it did, he very nearly drove it into the back of me. Now there’s nothing like as much snow here in our Mews, it’s not nearly as cold, and the car starts at the first twist of the key in the morning without the need for a midnight warm-up. All the same, the effort required to clear the snow from on top of and in front of the car and to clear a track out into the exit road from the Mews has increased in proportion to my age and waist-line, and by the end of it I was uneasily remembering the statistics of old age pensioners, some a decade younger than me, dropping dead from heart attacks from similar exertions in English snow-storms. I seem to have survived, so far, to fight another day (tomorrow). But the knowledge that the car on the ice-bound roads could well be the only way of getting to a doctor or a hospital Accident & Emergency department in case of a sudden medical problem affecting either of us is a little depressing. Luckily these things don’t generally last long in this country, courtesy of the Gulf Stream. But those old generalisations seem no longer to be operative now in the age of Global Warming. Roll on summer! No doubt the unprecedented heat-waves will kill twice as many old age pensioners as the snow. Brian writes: This comment has been transferred to a new post, here. Many thanks, Brian, for the snowy Moscow reminiscences and for those nice pics of S.W.18 under six inches of the stuff. My wife Brenda, born and bred in Augusta, Maine where the snow lay from November to April, says disparagingly: ‘Six inches? We used to get six feet’ (but not all at once, surely?). She recalls rolling happily in the snow as a girl – the idea makes me shudder – and snow-drifts up to the upstairs windows, and people in remote cottages receiving supplies down the chimney. I myself recall four winters in Boston, 1959-63, where a blizzard could dump eighteen inches in a few hours, and the city went completely silent, and your car, already unrecognisable, was likely to be completely buried by the drifts thrown up by the city’s indefatigable snow-ploughs, or plows. If there was then a sudden partial thaw followed by a freeze, you were in trouble. Fortunately I lived only six minutes’ walk from Boston U. where I worked. Here in Dundee close to the Tay there was just a sprinkle on Sunday night, and yesterday there were spells of bright sunshine alternating with flurries of snow, sleet, or hail. Today — Monday — there is a piercing easterly gale and driving rain. ‘Global warming’ seems to have produced cooler summers in these parts, but distinctly milder winters; fewer hard frosts and much less snow, though just as much cloud and perpetual wind. Brian writes: Thanks for this, Tim. Please see my comment (below) on the many amused references, not only by Brenda, on the effects on England of a mere six inches. Tim’s wife (see preceding comment) is not the only North American, or indeed northern European, to have been amused by the drastic effects on England of a mere six inches of snow. As mentioned in my original post above, J. and I are not unfamiliar with very cold and snowy environments — our year in Canada, at Kingston Ontario, was one of the worst — but in our experience what determines the severity of the snow experience is not so much the number of inches (or centimetres) of the white stuff that falls on you, but rather the extent to which you have available the means of coping with it: roads cleared by snow-ploughs/plows and gritted from the first snowfall and regularly thereafter; public transport of all kinds pre-equipped to deal with snow, including tube and railway line points all fitted with de-icers; lots of thermal underwear, fur-lined boots with heavy treads, lots of layers rather than single thick garments, fur-lined gloves, fur hats; snow-blowers and efficient ice scrapers and snow brushes; studded snow-tyres/tires or chains; and basic skills in driving on snowy and icy roads (knowing which gears get you out of trouble, what to do when the wheels spin, how to brake by dabbing instead of keeping the brake pedal down, how to steer into and then out of a skid; what equipment to keep in the car (shovel, ideally some tree-branches or other stuff for traction, thermos with hot drink, blanket, Scotch or brandy, change of dry clothes); and membership of a society whose members have similar skills and equipment so that people get in to work, schools and offices stay open, life goes on. Obviously few people in England, or even Scotland, possess more than a handful of these skills or goods because we generally need them only every 15 or 20 years and to invest in them all for such infrequent and briefly needed use would be laughably uneconomic. It explains why six inches wreaks just as much havoc with our lives as six feet would do: depth, like size in another context, isn’t what matters. Folks in Maine or Norway or Saskatchewan might well have similar difficulties in coping with a tropical heatwave of Nigerian or Libyan intensity if they experienced it only once in every two or three decades, although it’s easier to take clothes off than to put the right ones on. Having said all that, though, I do get the feeling that life in England has been much more severely disrupted by Sunday night’s fairly modest snowfall than has been the case with previous snowstorms of comparable intensity. According to the former mayor of London, Ken Livingstone (not, admittedly, everyone’s cup of lukewarm tea), Monday of this week was the first time in more than 100 years that the entire London bus service has been suspended. I don’t recall that anything like so many schools have been closed on previous occasions: usually at least some teachers, and some pupils, have been able to struggle in somehow. I suspect this is because everyone in Britain (or anyway in England) has for some reason become far more risk-averse in recent years. The Health and Safety Executive bans perfectly harmless traditional activities in case just one precious individual may be harmed by some freak accident. EU regulations are sometimes based on similar batty risk assessments. Government has an unappeasable appetite for locking up people who have done nothing wrong but who some committee of men in suits thinks may commit a crime, or self-harm, or behave in an anti-social manner, at some unidentified future date. Now schools are kept shut after some snow has fallen lest a single child, on its way to or from school, should inadvertently slip on a patch of ice and break its leg. In case a bus full of passengers should slide on ice and hit a kerb, not a single bus is allowed to operate. Ordinary parents and other adults simply can’t be trusted to take ordinary precautions if they go outside the house to go to work or to take the kids to school, just because some roads and pavements are slippery. In one part of the country even the parks were closed today because not enough park wardens had reported for work: so the local children (and some adults) were denied the once-in-a-decade opportunity to go sledging down the hill on a dustbin lid, to throw snowballs at each other or to build a snowman. It’s not basically the risk that frightens people: it’s the fear that if someone’s hurt, the person who made the decision to allow the school to open, or the buses to run, or the parks to open without the usual number of wardens, will be blamed for that decision and the tiny risk that it entailed. Authority is primarily concerned to cover its back, and everyone else gets less fun in life as a result. Risk, like the poor, is always with us. Just occasionally we should be allowed to take it. As I’m posting from Orkney where we’ve just had the first proper snow of the winter although the temperatures have been warmer than south, if you discount the wind chill, it does seem to me that in the south of England a couple of inches is an emergency and a bit of wind and snow a blizzard. (The media do love a panic don’t they?) My point in commenting is however that very often health and safety, whether the HSE or the internal workers, is blamed when the culpability may rest with an organisation’s insurers who are beyond risk averse in their efforts to avoid, even dodge, liability. In addition, the propensity to seek legal redress and hence compensation when an accident happens – you will have seen the advertisements – adds to the caution of insurers and the cost to the country. Unfortunately this results in the scaredy cat reactions of the councils – although admittedly some are cautious politically anyway. Brian writes: That’s a very good point about the insurance companies’ influence on decisions, as well as the perceived threat of being sued for damages if the smallest accident or injury occurs. It all helps to reinforce the panicky instincts of a growingly risk-averse culture. We’re all losers as a result — except perhaps the insurance companies and the lawyers…. Brian writes: An all too credible horror story, alas. Whatever happened to common sense? Next story More rendition under the new US President?